A magical circuit in the Andes with 4×4 to explore the stunning Payunia Park, which counts the highest density of volcanoes on Earth: lunar landscapes, amazing color scales and unique wildlife ; In the region of Malargüe, Southern Mendoza, you will discover breathtaking landscapes and very hidden gem locations like El Sosneado, at very reasonable elevations (max 2500m/8200ft). 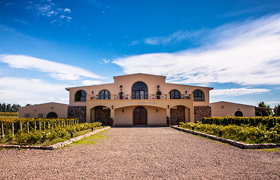 Accommodation in charming B&B and luxurious Cabañas (chalet), you will live the perfect adventure, with the security of a driver and expert guide. 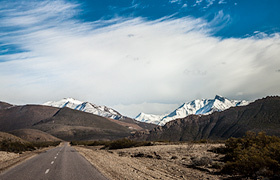 The drive to reach Malargüe, small town in the south of the province of Mendoza, will go through a stunning road: the old road 40 which crosses the cordilleras and the Diamante river (el rio Diamante). 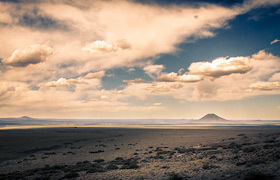 The immensity of Argentina will appear an hour and a half after departure; glaciers and volcanoes in one side, plains as far as the eye can see on the other. After 120 km (75 miles), you will reach km 3,000 of route 40 in Sosneado – place sadly known for the Uruguay Rugby team plane crash in 1972. 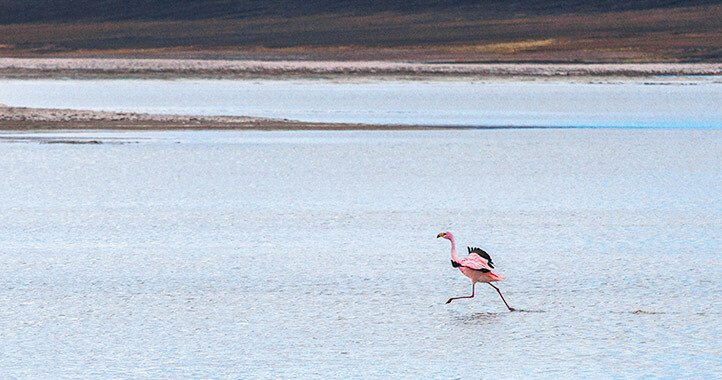 From this point, you will visit Laguna Blanco, chalk cliff lagoon nestled in the cordillera where flamingos come to eat. The last 50 km (31 miles), will lead you to your luxurious cabaña (with indoor swimming pool, sauna) in Malargüe. 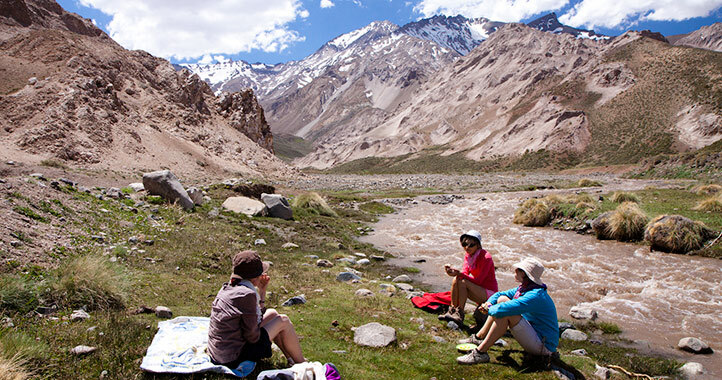 Relaxing day while getting into the magnificent landscapes of Malargüe’s Valleys. You will follow Route 222, leading to the famous ski resort of Las Leñas and have the opportunity to stop whenever you want to take photos and observe the odd geological forms of this area. Afterwards, you will visit the Niña Encantada Valley (Enchanted Child) with the Indian Legend, Pozo de las Animas and to finish Las Leñas. 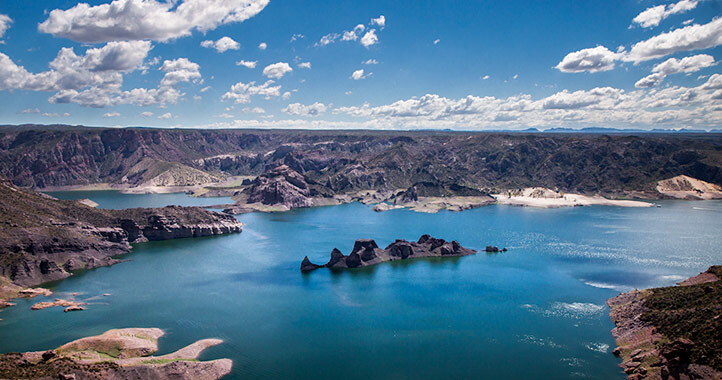 Depending on the season (from December to April), you will have the chance to climb to Valle Hermoso, extraordinary road leading to a mountain lake; the panorama from the monolith is breathtaking! Picnic lunch or restaurant depending on the opening season of the Los Molles resort. LET THE ADVENTURE START NOW! 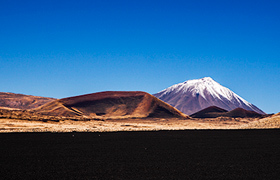 It is actually tough to describe precisely this day… the landscapes are sooo breathtaking and will give you strong emotions of being in the middle of this volcanic immensity. After an hour and a half of asphalt (on the newly asphalted road 40), you will reach ‘La Pasarela’, your first stop. You will be able to go down to the nearest canyon, created by the erosion of the water and the wind into the lava. 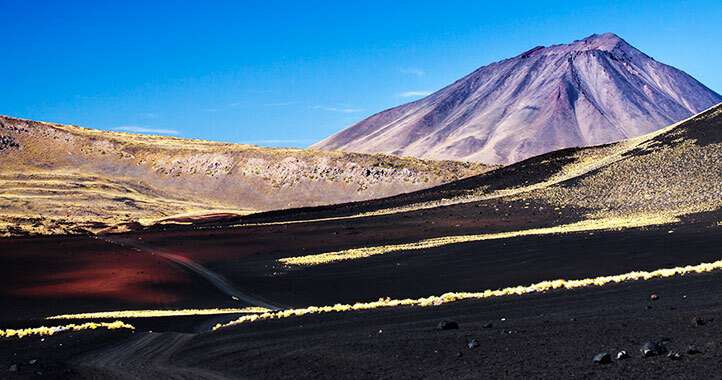 Then, a 2-hour drive is necessary to reach the heart of the Pampa Negra, with the scenic open crater of the Morado volcano where you will realize that you are walking on an unchanged land since the dinosaurs’ era. 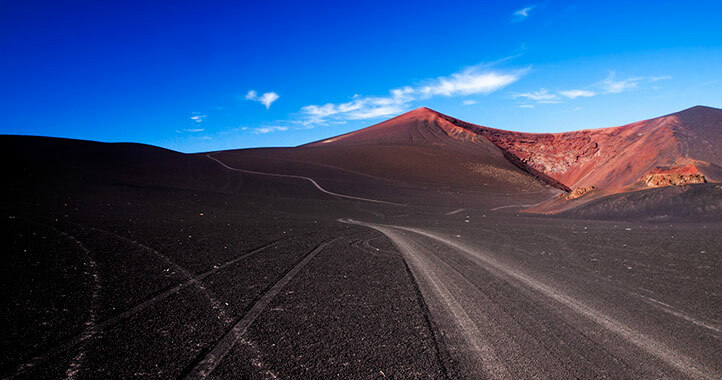 You will have the chance to do 2 short hikes: one in the bright red crater, the other one above the crater for a spectacular view of the Andes and the impressive lava flows of the Morado. Finally, we head to the majestic volcano Payun Liso and the Payun Matru (one of the largest volcanic craters in the world) for an unforgettable picnic. 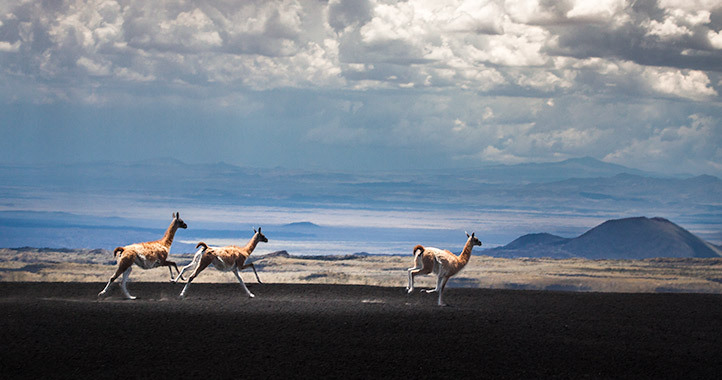 After a sweet nap where the volcanic ash warms your back on the ground, it will be time to return, not without saluting the guanaco and ñandus (emus) through the huge oil lands. A day of 10 hours of excursion approximately according to the tracks’ conditions generating memories for your entire life. After this incredible day encircled by volcanoes, we head for a destination known only by locals. El Sosneado (on route 220) is a return to the past until the ghost hotel and its sulfur baths on the edge of Atuel River, almost at the source. 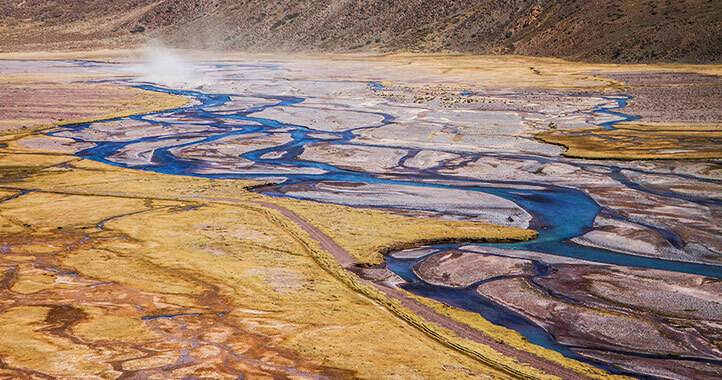 A colorful day giving the opportunity to meet the wild life in the heart of the Andes. A new background appears at every turn of the road. The loneliness atmosphere will make you thoughtful in front of the beauty of the surrounded nature. If the track conditions permit, you will go until the end of the road, where start our expeditions to the place of the plane crash of the Uruguayans (extension of 3-4 days possible by horseback riding and/or hiking). Picnic lunch where the big and crushing surroundings will make you forget the stern wind. 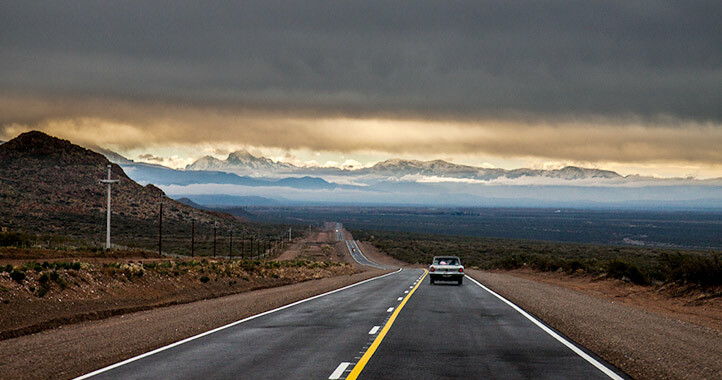 On the way back to Mendoza, you will have the change to drive through the Atuel Canyon, a geological wonder of 80 million years. The 50 km (31 miles) road between the colored natural shapes and the cliffs where the condors live, makes you dizzy. Throughout the river, hydroelectric power stations remind us of the importance of water in these regions, located in the middle of deserts. The wind and the water erosion in ancient times have carved surprising figures on the rock. Today, these figures have names: El Mendigo, the Bosque de Coníferas, the Jardines Colgantes, El Elefante, El Sillón de Rivadavia, Los Monstros, El Lagarto, etc. 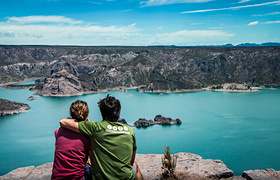 At the end of the canyon, we will stop for an exceptional panoramic view on the lake of Valle Grande. The central island of the lake has a submarine form, extraordinary moment. Local dishes lunch will be served in one of the many restaurants along the Rio Atuel towards San Rafael. 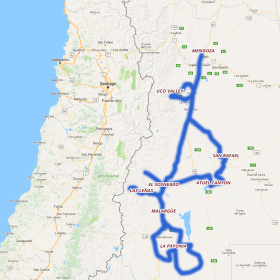 DRIVE: tracks and asphalted, 250km (155 miles) approx. Departure at 10 am approx. 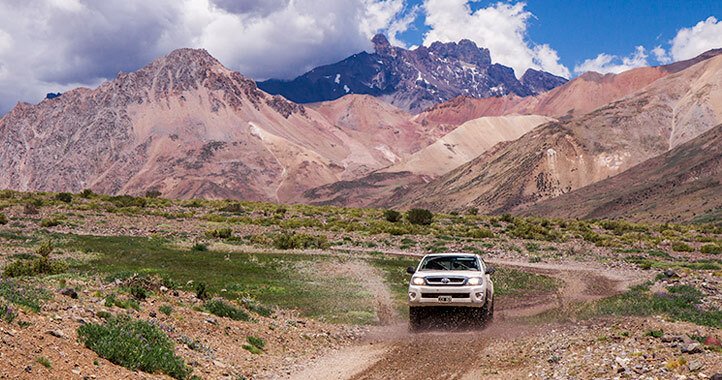 to go back to Mendoza with a stopover at the precious Uco‘s Valley. Let’s start the visit of the outstanding Piedra Negra French bodega along with a wine tasting of the best vintages of the property. 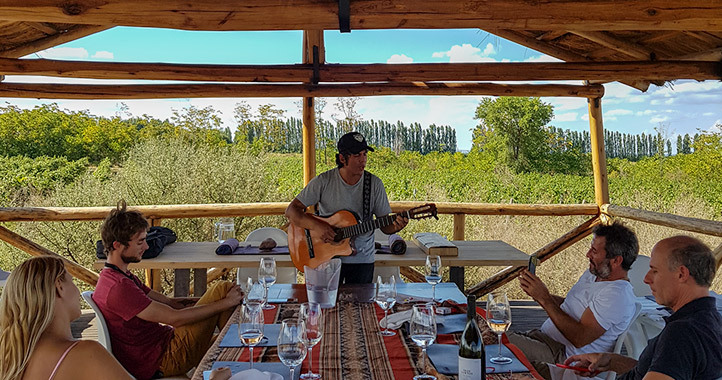 Lunch will be served in the middle of the vineyards of Chacayes, one of the most beautiful terroirs of this new wine-growing area, homeland of some of the greatest wines from Argentina. 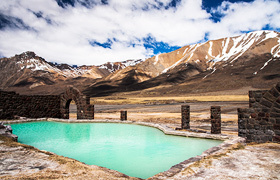 Return to Mendoza or accommodation in the Uco Valley according to the rest of your trip. 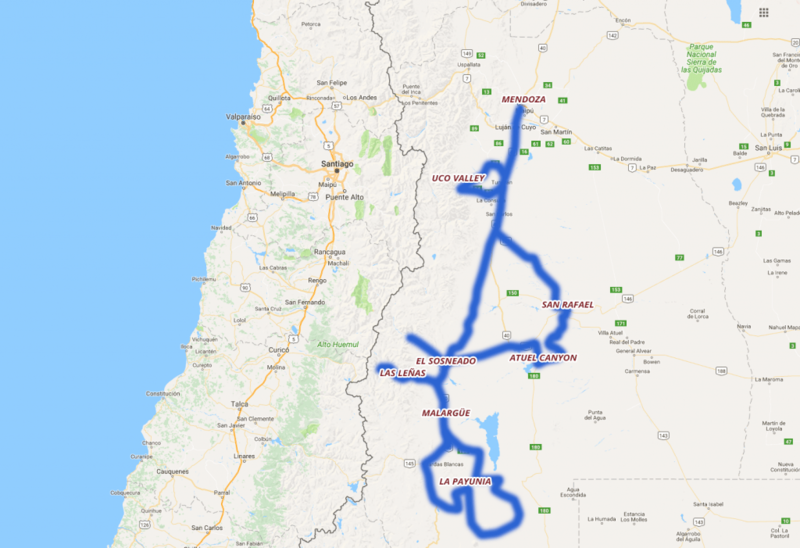 DRIVE: Asphalted roads, 250km (155 miles) approx. 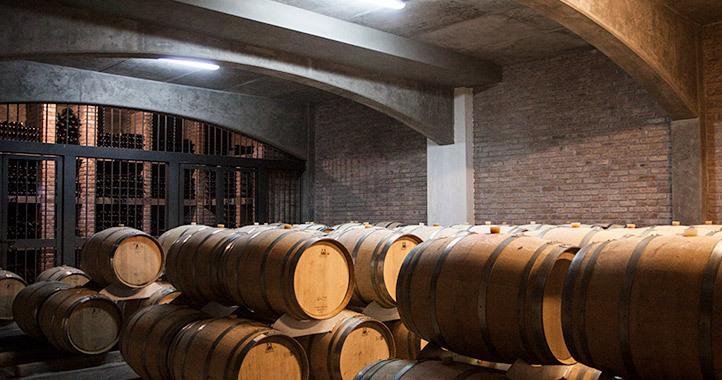 From 1 to 5 days wine tours in Mendoza, only the best wineries, only driven terroir and single vineyards tasting. 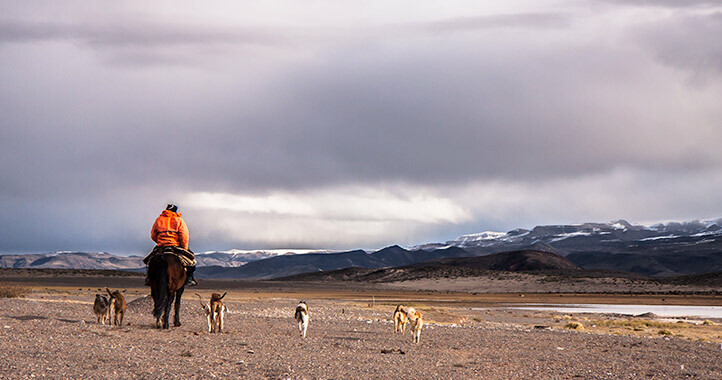 The most authentic horseback riding into Mendoza Andes. Live an entire day with a real gaucho and his family in his mountains. Only for 3 months a year (End December to end March), what about discovering this absolut gem in Mendoza ? A full day climbing to the Maipo Volcano and his amazing lake, where Henri Guillaument from Aeropostale had to force land and survive. The “Best Seller” in Mendoza ! A full day on route 7 to walk into the Aconcagua National park and watch the highest summit of the Americas (and 2nd highest on the Earth after Himalaya) at 6962m/22841ft. Many stops for amazing pictures along the route, and nice BBQ/Asado lunch. 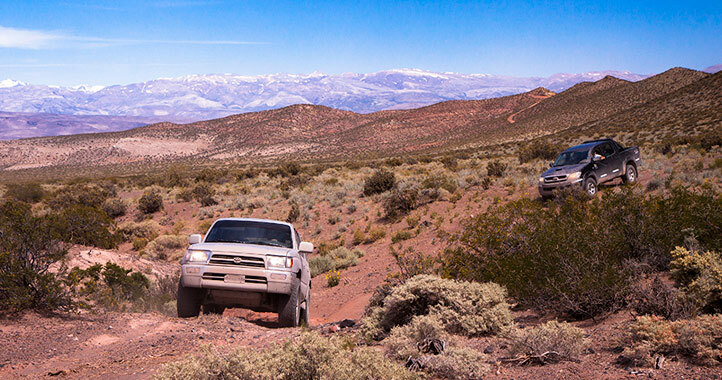 Not enough 4WD during the road trip ? 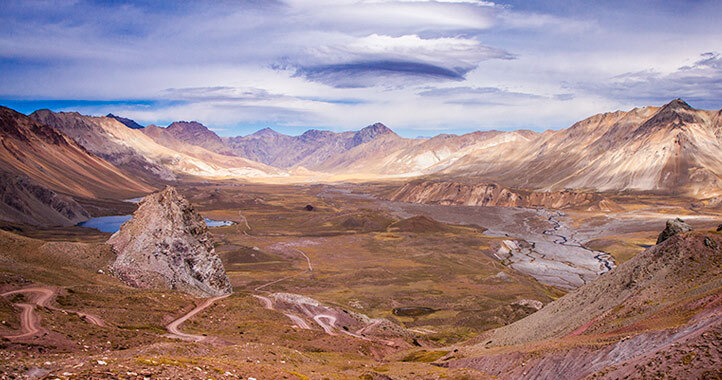 then go to visit this beautiful route who leads us to a fantastic panorama on the Aconcagua, while watching all wildlife of the Pre-Andes. Old mines and rainbow colors mountain are at the program too. 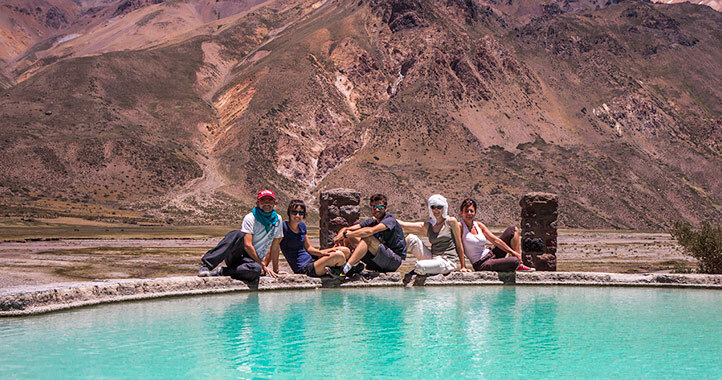 A must do in Mendoza, enjoying the peaceful silence of the Andes. No specific training is required, only high-altitude acclimation. It is mandatory to follow your guide’s advice. Asphalted roads, tracks in sand and rocks. Breakfasts are included, as lunches or picnic lunches. Dinners for passengers and the guide are not included. Dinner in a standard restaurant is about U$D 25-35, depending on beverages. Will be transported in the open trunck of the 4×4 vehicle and must be dust-tight. Plastic bags will be provided to protect your belongings from dust, sand and the possible rain. 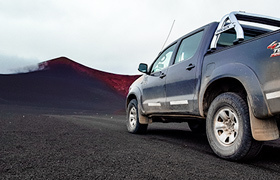 The vehicles are pickup trucks type without cover for more convenience. Small backpack for hikes with a capacity of 10 liters approx. You will use it to keep your personal belongings during the day (camera, sunscreen, hat, scarf …), valuables (in case your accommodation does not have a safe locker) and for your possible medications. 1 pair of sandals or casual shoes for the evening. Packing list must be adapted according to the chosen season. Temperature amplitudes are very important in the desert regions visited (from 20 to 30 ° difference sometimes between night and day). The nights are usually chilly, even in summer time. As usual, it is preferable to be vaccinated against diphtheria, tetanus, poliomyelitis, hepatitis A and B, whooping cough, measles for children. 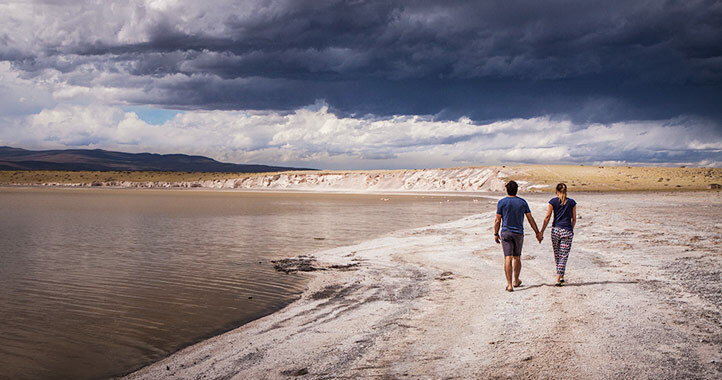 It can be considered that Argentina is not a country at health risk for the traveler. Observe the advice of your Embassy. The medical infrastructure is excellent in Salta hospitals. It is therefore, in many cases (even serious), not necessary to consider a medical repatriation. In case of issue, however, you will have to contact your personal insurance company and possibly the Embassy in Buenos Aires.